1.06 - Odell Beckham, WR, New York Giants: I didn't plan to start this mock with four consecutive WRs, but the challenge with going WR in Round 1 is that there are major question marks with the RBs beyond the top 9-12 and those will be the options in the second half of Round 2. That said, Beckham has a minimum of 90/1,300/10 in each of his three NFL seasons and no player has more receiving scores during that span. Even with the addition of Brandon Marshall, OBJ remains a top-three fantasy wide receiver. 2.07 - Dez Bryant, WR, Dallas Cowboys: The two main concerns with Bryant are durability -- missed at least three games in each of past two seasons -- and the team's run-heavy offense. That said, Bryant can be dominant in the red zone and he was much better (and more featured) in the second half of the season as he and Dak Prescott built a stronger on-field rapport. 3.06 - Demaryius Thomas, WR, Denver Broncos: Posting a disappointing 90/1,083/5 line in 2016, Thomas averaged 100/1,447/10 over the previous four seasons. I don't expect a 1,400-yard season, but things should be better in 2017 if he can avoid nagging injuries. 4.07 - Allen Robinson, WR, Jacksonville Jaguars: A disappointing season from A-Rob was primarily caused by a disappointing season from Blake Bortles. Even if Bortles is better in 2017, the concern is that the team will use a run-heavy approach with rookie Leonard Fournette. That said, A-Rob was the best available player here and there is tremendous upside with him as my WR4/flex. 5.06 - C.J. Anderson, RB, Denver Broncos: Especially if Jamaal Charles makes the 53-man roster and stays healthy, a committee approach should be expected in Denver. That said, I do expect CJA to lead the backfield in touches and Charles isn't a lock to make the roster given his salary situation (and knees). 6.07 - Dalvin Cook, RB, Minnesota Vikings: Not thrilled with CJA as my RB1, I loaded up on RB2/flex options here. Among the running backs on this mock draft roster, Cook has the potential to be the top producer. The offensive line is a concern (better than last year but still a concern). Going into the season, however, Cook should get the largest share of the workload with a chance to take control of the lead-back role early in the year. 7.06 - Ameer Abdullah, RB, Detroit Lions: Coming off a Lisfranc injury, Abdullah missed almost all of the 2016 season. Averaging 5.6 YPC and 11/4 Y/R on limited touches, he was off to a good start and 2017 has the potential to be a breakout season if he can stay healthy. 8.07 - Paul Perkins, RB, New York Giants: The Giants drafted Wayne Gallman in the middle rounds, but Perkins should see 60-plus percent of the backfield's touches in 2017. With Eli Manning having the most talented group of pass catchers he's ever had, that should (help to) open things up on the ground for Perkins. 9.06 - Samaje Perine, RB, Washington Redskins: It wouldn't be a surprise if Perine emerges as the starter or primary ball carrier. Either way, he should be plenty involved early in the season with multiple productive outings throughout the season. 10.07 - Corey Coleman, WR, Cleveland Browns: Injuries limited his rookie season and the team still has shaky quarterback play. If he can stay healthy, however, there plenty of upside here. 11.06 - Eric Ebron, TE, Detroit Lions: Speaking of durability concerns, Ebron has missed multiple games in all three of his NFL seasons. But he set career highs in absolute terms with 61 catches and 711 yards and in relative terms with 54.7 YPG and 11.7 Y/R. 12.07 - Jameis Winston, QB, Tampa Bay Buccaneers: With the team's investments in free agency and the draft, Winston is poised to have his best season as a pro. 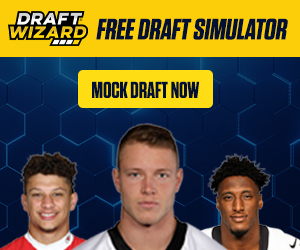 As the QB12 in this mock and in Round 12, he offers plenty of value -- something that is usually available in any mock for those that wait on the position. 13.06 - Tyrod Taylor, QB, Buffalo Bills: No team threw the ball fewer times than the Bills (474) in 2016, but that didn't keep Taylor from finishing as a top-10 fantasy quarterback (QB8) last season. The dual-threat quarterback has rushed for 1,148 yards and 10 touchdowns in his two seasons as a starter and his rushing production helps to raise both his weekly floor and ceiling. 14.07 - Breshad Perriman, WR, Baltimore Ravens: Before signing Jeremy Maclin, Perriman had the potential for a breakout season. While it's likely that he's better than he was last season, he'll be third in line for targets behind Maclin and Mike Wallace. 15.06 - New York Giants DST: Best available defense in the last round.